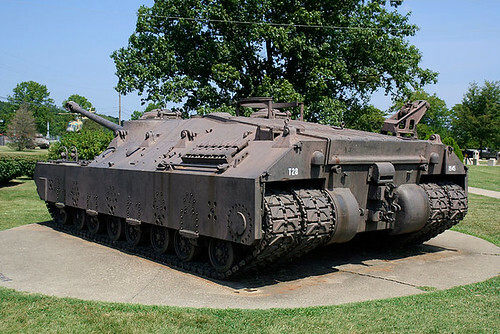 Patton Museum of Armor at Fort Knox - T28 Super Heavy Tank, originally uploaded by PGM Photography. Originally designed to go against the formidable Siegfried Line in Europe, the first prototype was not completed until December of 1945, too late to see in combat. Powered by the same Ford GAF V-8 gasoline engine used by the M26 Medium Tank, this vehicle was so heavy that the transmission and final drive had to be geared down to a top speed of 8 miles per hour. Double tracks were necessary to prevent it from sinking into the ground on cross-country treks, but the outside track assemblies on each side could be removed to allow transport by truck or rail. The frontal armor is 12” thick, with an 11.5” on the gun mantlet, which protected the 105mm canon. The side armor over the tracks is 4” thick. Only two of these monsters were ever completed, with this prototype (Pilot Vehicle #1) being the only survivor.